As we get closer and closer to the election, there is just too much going on to try to say something -- especially something particularly witty or eloquent -- about each issue, each new speech or sound bite, or each new controversy. So, once again, I'll have to make do with a brief roundup of news and videos. Now think about what Sen. McCain said (or didn't say last night). For the record (and I still want to write in more detail on this issue later), I have yet to see video or hear audio of any supporter of Sen. Obama threatening violence against Sen. McCain or Gov. Palin. Sure people may make crude jokes or offer insults; that's politics. But when the rhetoric becomes violent ("terrorist", "kill him", "bomb Obama"), then we've left the realm of politics and entered the realm of government by fear that isn't much different from the third world countries where political violence is the norm rather than the rare exception. Moreover, despite Sen. McCain's claims last night, I have yet to hear either Sen. McCain or Gov. Palin say or do anything to directly dissuade their supporters from using violent rhetoric. Next, please take a moment and go see what a Palin presidency might look like. Click everywhere. How many surprises can you find? Five campaign officials, including manager Rick Davis, have worked as lobbyists for Verizon. Former McCain staff member Robert Fisher is an in-house lobbyist for Verizon and is volunteering for the campaign. Fisher, Verizon chief executive Ivan G. Seidenberg and company lobbyists have raised more than $1.3 million for McCain's presidential effort, and Verizon employees are among the top 20 corporate donors over McCain's political career, giving his campaigns more than $155,000. McCain's Senate chief of staff Mark Buse, senior strategist Charles R. Black Jr. and several other campaign staff members have registered as AT&T lobbyists in the past. AT&T Executive Vice President Timothy McKone and AT&T lobbyists have raised more than $2.3 million for McCain. AT&T employees have donated more than $325,000 to the Republican's campaigns, putting the company in the No. 3 spot for career donations to McCain, according to the nonpartisan Center for Responsive Politics. One thing that had me worried for a little while was an article that I saw posted on a right-leaning blog about an interview that Michelle Obama gave to "Africa Press International". According to the article, some of the things that Michelle Obama is claimed to have said could have been damaging to Sen. Obama. But hold on; the alleged interview never happened and the article was a fake. Even the National Review Online took the time to post a notice that the article was a fake (probably so that the right wing blogs wouldn't degenerate into an uncontrollable frothing mob at the prospect of derailing Sen. Obama's candidacy). Finally, I want to take a look at a few moments from last night's final debate and associated coverage. First, is one of the best moments of the debate, but only if you were watching the split screen. 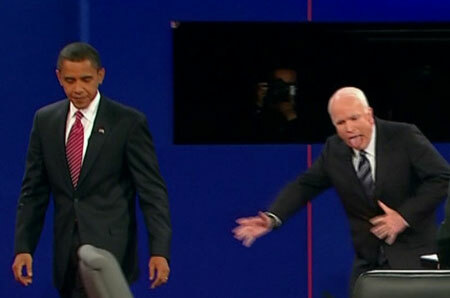 Don't watch Sen. Obama; instead, just watch Sen. McCain. Seven seconds into the video, watch Sen. McCain's face as he realizes that he has just lost the election. "This is a good night for Barack Obama" is not exactly the message that Fox or its viewers were hoping for. Yup, He actually puts "health" in cute little finger quotes. Attention women who supported Hillary Clinton: Forget Gov. Palin for a moment and just listen to and watch Sen. McCain. Are you still thinking about voting for the Republican ticket? Remember that the next President will likely have the opportunity to appoint at least two, if not more, justices to the Supreme Court. He is a decent person, and a person that you do not have to be scared of as President of the United States. So which is it? Do we believe Gov. Palin that we face "real danger" if Sen. Obama is elected or do we believe Sen. McCain's statement that we "do not have not have to be scared of"? Within hours of my endorsement appearing in The Daily Beast it became clear that National Review had a serious problem on its hands. So the next morning, I thought the only decent thing to do would be to offer to resign my column there. This offer was accepted—rather briskly!—by Rich Lowry, NR’s editor, and its publisher, the superb and able and fine Jack Fowler.